The Western Association of Fish and Wildlife Agencies (WAFWA) has entered into an agreement with the Bureau of Land Management (BLM) and the Association of Fish and Wildlife Agencies (AFWA) to enhance communication and collaboration regarding fish and wildlife habitat management on public lands in the West. The Memorandum of Understanding (MOU) was signed July 16 at WAFWA's annual conference in Eugene, Oregon. BLM's Kristin Bail, AFWA President Virgil Moore, and WAFWA President Curt Melcher signed for their respective organizations. "Working together with our partners to enhance fish and wildlife conservation in the West is one of the primary goals of WAFWA," said Curt Melcher, President of WAFWA and Director of the Oregon Department of Fish and Wildlife. "We welcome the opportunity to be a party to this MOU. The Bureau of Land Management is a key player on the western landscape, and any time there is a firm commitment to communicate and collaborate more with the states, that is a positive development." The new MOU establishes a framework and communication protocols for the BLM to proactively coordinate with AFWA, WAFWA and the state agencies they represent on wildlife issues of mutual interest. Those issues include wild horse and burro management, wilderness management, land use planning, energy and mineral development, forestry, grazing management and conservation and recreational activities for big game, migratory birds, upland game, reptiles, amphibians and fish. Resources Legacy Fund is partnering with the Western Native Trout Initiative (WNTI) with a $278,000 grant from the Open Rivers Fund. This collaboration will benefit Bonneville Cutthroat Trout, recreational fishing, and ranchers who divert water for irrigation in Utah, Idaho and Wyoming by reconnecting parts of the Upper Bear River in those three states. The partnership will ultimately fund eight restoration projects that will remove five diversion dams, three additional barriers and restore stream and riparian habitat. "Our partnership with Western Native Trout Initiative will demonstrate ways to both upgrade irrigation infrastructure and reconnect rivers for fish," said Kathy Viatella, Program Officer for the Open Rivers Fund. "We hope these initial projects show ranchers across the West that there are ways to reduce irrigation diversion maintenance and costs while freeing native species to reclaim lost habitat." The Western Native Trout Initiative (WNTI) is awarding $232,640 in grant funding for eight projects that benefit native trout species in Colorado, Idaho, New Mexico, Oregon and Wyoming. The community-based projects are funded through the National Fish Habitat Action Plan and the U.S. Fish and Wildlife Service. The projects were selected because of their emphasis on collaborative action to address some of the biggest challenges facing the restoration and recovery of western native trout. "Our main objectives are to leverage and support strategic, local efforts that stabilize, recover and improve populations of western native trout," said WNTI Coordinator Therese Thompson. "In addition to the grant funding we're providing through the National Fish Habitat Partnership, local partners have secured additional matching funds totaling $2.33 million dollars for these projects." The shinnery oak ecoregion of eastern New Mexico and the Texas Panhandle saw the biggest annual increase in birds, followed by the sand sagebrush ecoregion of southeast Colorado and southwest Kansas. The shortgrass ecoregion which covers northwest Kansas also registered an annual increase in the number of breeding birds. The estimated number of birds in the mixed-grass ecoregion spanning the northeast Panhandle of Texas, northwest Oklahoma and south-central Kansas is similar to last year's estimate. 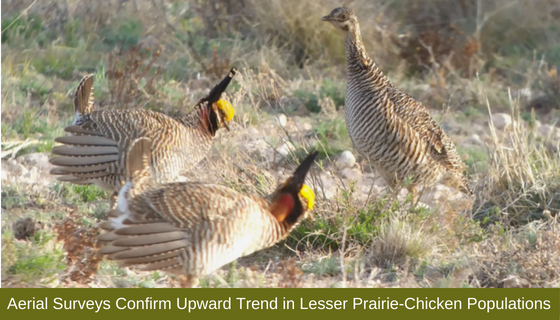 "We're encouraged by this year's numbers but are mindful that successful conservation of the lesser prairie-chicken will require decades of consistent progress," said J.D. Strong, Director of the Oklahoma Department of Wildlife Conservation and Chairman of the Lesser Prairie-Chicken Initiative Council. "The continued success of the range-wide plan depends on ongoing participation by industry partners, and we are grateful for the support shown thus far. The U.S. Fish and Wildlife Service will be making another ruling on the status of the lesser prairie-chicken later this year, and industry support of the plan is more important than ever. At such a critical juncture in the conservation of this important but imperiled prairie grouse, we encourage industry to contact us and get involved." An upcoming workshop in Laramie, Wyoming will provide a close look at the latest development in the science and policy of big game migrations. The workshop will be held Aug. 28-29. Attendees will have the opportunity to be trained in new modeling software for analyzing big game movement data. Participants will also discuss how WAFWA's Crucial Habitat Assessment Tool (CHAT) can better support on-the-ground wildlife management. CHAT is a non-regulatory system of online maps, which presents data in a hexagon format that provides a landscape-scale perspective of habitat but does not identify specific locations or property ownership. The workshop is hosted by WAFWA's Mule Deer Working Group in collaboration with The Sagebrush Science Initiative, the U.S. Geological Survey, the Wyoming Migration Initiative, the Mule Deer Foundation and the Pew Charitable Trusts. 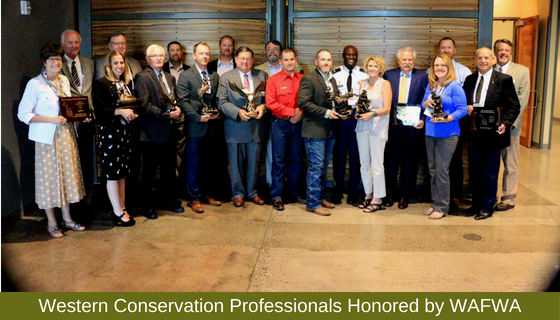 The Western Association of Fish and Wildlife Agencies (WAFWA) has honored conservation professionals from several western states with awards commending their work to conserve fish and wildlife resources. The awards were announced at WAFWA's annual summer conference. John D. Groendyke from Oklahoma was honored with WAFWA?s most prestigious award, the Phillip W. Schneider Lifetime Achievement Award. Groendyke was honored for his more than four decades of leadership on the Oklahoma Wildlife Conservation Commission. Wyoming Game Warden Dustin Shorma was honored with WAFWA?s Pogue-Elms Law Enforcement Officer of the Year Award. He's been a game warden for more than 18 years and is widely recognized as being one of the hardest-working, effective and most dedicated wildlife officers in Wyoming. There were two honorees for WAFWA's 2018 Professional of the Year Award. Doug Howie was recognized for his consistent professionalism and resourcefulness in administering North Dakota's Private Lands Open to Sportsmen (PLOTS) program. Jason Schooley was honored for his contributions in managing Oklahoma paddlefish stocks based on sound scientific data, population modeling, and angler input.